Pumpkins are actually a fruit not a vegetable. Decaffeinated coffee is not caffeine-free. a single banana is a finger. Onion is Latin for large pearl. Fresh fruit is a better snack than dried fruit. The term “superfood” is a misnomer. The stickers on apples can be eaten, too. About 75% of the fat in an avocado is monounsaturated. up to 1,000 mg of sodium. less than 1,600 mg of sodium a day. Registration recognises nutritionists who have relevant qualifications (as determined by the NSNZ registration panel), work experience, a high standard of professional conduct and a commitment to continued professional development. Registration enables New Zealanders to identify those nutritionists with qualifications and experience whose credentials have been accepted by the Registration Panel of the Nutrition Society of NZ. Registered Nutritionists are registered in a field of expertise: Public Health, Education, Practice, Scientific Research, or Industrial Research. provide evidence of continuing competency. A Bachelor degree in nutrition from University of Otago, Massey University or Auckland University is considered acceptable. Qualifications from other Universities may be considered if the degree contains sufficient science and specific nutrition papers. . In addition to a basic academic qualification, you must have 2-3 years of professional experience in the field of nutrition. The selection process is overseen by the Nutrition Registration Panel which is an expert group of Nutrition Society members representing academia, industry, government and private practice. Registered Nutritionists can work in a diverse range of settings. Registered Nutritionists work within their specific fields of expertise (as determined by the Nutrition Registration Panel), adhere to The Royal Society of New Zealand Code of Professional Standards and Ethics and must participate in a Continuing Education Competency Programme. Use the following flowchart to check whether you are eligible to register. Before you can apply to become a Registered Nutritionist, you first have to become a member of the Nutrition Society. The cost of this is $100.00. The forms are downloadable from the membership page of the website. Those applying for Associate Registration pay the student rate of $45. Once you’ve joined the society, you can then apply to become registered. The document Becoming a Registered Nutritionist Explanatory Notes provides detailed information on the registration process. If you are eligible for registration please download the following documents. Associate Registration is for those who have recently graduated with a Bachelor degree (majoring in nutrition) but have not yet acquired the work experience needed for full registration. To be eligible for Associate Registration candidates must have completed an undergraduate degree, and be employed in a nutrition work setting or working towards a nutrition-related post-graduate qualification. After completion of one year of post-graduate study or one year full-time work experience, candidates will be eligible to apply for Associate Registration. During this year (between completion of undergraduate degree and application for Associate Registration) candidates will be supported by a professional mentor. The mentor will be selected by the candidate and approved by the nutrition panel. The document Becoming an Associate Registered Nutritionist Explanatory Notes provides detailed information on the registration process. You will also need to download the following documents to complete the application. Registered Nutritionists are required to re-register every 3 years and provide evidence of continuing competency. Each Registered Nutritionist is responsible for determining their continuing competency requirements. There are no set criteria. Each application will be considered on its own merits by the Registration Panel. If you have not provided evidence of your competency or do not meet the competency requirements, you will not be billed the registration fee of $75.00 for the following year and your name will be removed from the register. We will make every attempt to contact you before removing your name. To provide evidence of meeting Continuing competency requirements you will need to download the following. It is recommended that all Registered Nutritionists receive professional supervision, whilst all those applying for registration or re-registration as a Registered Nutritionist with the field of expertise in ‘practice’ are expected to receive professional supervision. A supervisor should be an experienced Registered Nutritionist, Registered Dietitian or health professional with expertise in the field of the supervisee. A list of registered Nutritionists and Dietitians is available on the respective websites. Alternatively, a list of qualified supervisors is available here. Please note supervision may cost and prices are to be discussed directly with the supervisor. For more information see the following hand-out from the session on professional supervision at the Nutrition Society Postgraduate and Early Career Conference. All forms for application to register should be sent by post to the following address. Any questions about registration should be emailed to Vicky Stedman (registration@nutritionsociety.ac.nz). Where can I study nutrition? The University of Otago, Massey University and University of Auckland offer undergraduate degrees and postgraduate diplomas in nutrition. CPIT and AUT also offer degrees which include nutrition. We have links and further information on these courses on the Education pages of the website. Is a qualification in natural or complementary medicine acceptable? The Society rules state that the applicant must possess a degree from a university with the focus of the degree being nutrition. The focus of natural or complementary medicine differs from a Bachelor Degree majoring in Human Nutrition. A natural medicine qualification may not include the necessary science subjects at a sufficient level. Relevant work experience in the field of nutrition is also required and the Society would not consider practicing in natural medicine as meeting our criteria. For those who are interested, explore registration with the appropriate professional body related to the natural medicine, for example NZ Society of Naturopaths. What subjects are relevant to nutritionists in the undergraduate degree? Relevant subjects are physiology, biology, chemistry, biochemistry, statistics, food science and specific nutrition papers. What is a satisfactory postgraduate qualification? The minimum requirement for postgraduate study is a postgraduate diploma, but eligibility is at the discretion of the Registration Panel. Judgment of what is considered specific to nutrition or relevant to nutrition is also at the discretion of the Registration Panel. If I have a Bachelor degree that is not in human nutrition, and a Postgraduate Diploma in Human Nutrition, can I become a Registered Nutritionist? The panel would consider the quantity and quality of the human nutrition papers of the Postgraduate Diploma. The panel would also consider the papers undertaken in the undergraduate degree. Relevant subjects are physiology, biology, chemistry, biochemistry, statistics, food science and specific nutrition papers. I have an overseas qualification. Do I need to have an NZQA assessment? This would be considered on an individual basis and would depend on the qualification. Contact the Registrar for advice. I have a Post-graduate Diploma in Human Nutrition but not a Bachelor of Science in Nutrition. Can I apply to be an Associate Registered Nutritionist? If you have a post-graduate diploma in Human Nutrition, contact the registrar to see it this would be sufficient. It would be expected that the applicant had completed some science papers at a undergraduate level. What counts as one-year of nutrition-related work experience to become an Associate Registered Nutritionist? Applicants may be involved in paid or voluntary work in nutrition. Some jobs are not solely nutrition jobs but cover a broad range of areas. Keep a record of the nutrition-related areas of your work and the proportion of your job related to nutrition. If you are not engaged in nutrition work full-time, it may take up to two years to gain the equivalent of one-year full-time work experience. Contact the Registrar if you are unsure. What is the difference between a Dietitian, a Nutritionist and a Registered Nutritionist? A Dietitian is a registered health professional who meets standards of professionalism required by the NZ Dietitians Board under the Health Practitioners Competence Assurance, who has an accredited undergraduate science degree in human nutrition, and a post-graduate qualification in Dietetics. Dietitians are trained in the science of nutrition and diet therapy, and qualified to work in areas that require nutritional assessment and counselling. A Nutritionist has usually completed a degree in Human Nutrition or related Science, and ideally has tertiary training in science, nutrition, biochemistry, medicine or sports physiology from a reputable tertiary institution. Nutritionists aim to improve the health and wellbeing of individuals, communities and the population as a whole, through better foods, diets and nutrition. Nutritionists can work in a variety of roles including research, nutrition consultants and advisors, public health and health promotion officers, food writing, and for governmental and non-governmental agencies, to name a few. The title of Registered Nutritionist can only be used by those who meet the standards determined by The Nutrition Society of New Zealand. Registered Nutritionists must hold a degree or academic qualification from a university or other recognised national institution of education. In addition to their basic academic qualification, they must have 2-3 years of professional experience in the field of nutrition. The selection process is overseen by the Nutrition Registration Panel which is an expert group of Nutrition Society members representing academia, industry, government and private practice. Registered Nutritionists can work in a diverse range of settings. Registered Nutritionists work within their specific fields of expertise (as determined by the Nutrition Registration Panel), adhere to The Royal Society of New Zealand Code of Professional Standards and Ethics and must participate in a Continuing Education Competency Programme. A Dietitian or Registered Nutritionist may work in a variety of settings ranging from Government, community, public health, sports, research & education and the food industry. Dietitians may also work in hospitals. Can I apply to become an Associate Registered Nutritionist if I am not a new graduate? 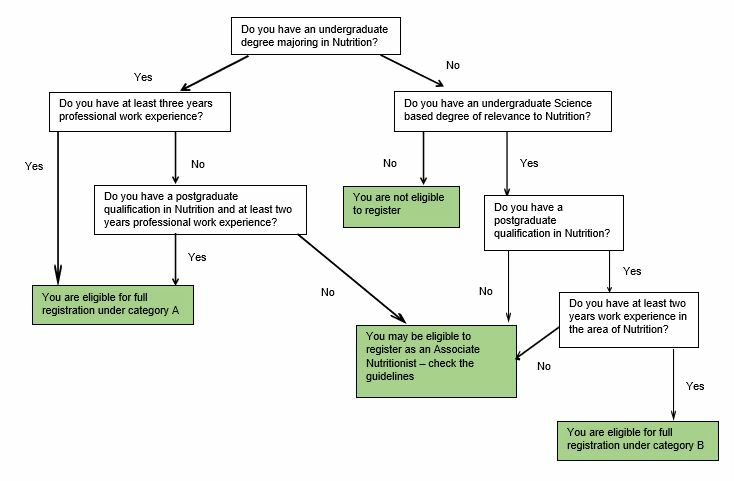 If you have insufficient work experience to become a Registered Nutritionist but are not a recent graduate, you can submit an application of intent. You would need to find a mentor and intend to work in a nutrition-related role or undertake post-graduate study in nutrition. Do I need to receive supervision? The Nutrition Society Registration Panel asks Registered Nutritionists applying for registration or re-registration in the area of practice to receive professional supervision. Those registered in other fields of practice, particularly those in a large workplace, may receive supervision according to the policies and procedures of their workplace. Supervision provides a regular time for facilitated, in-depth reflection on practice from an experienced practitioner. The panel would expect a nutritionist to be meeting with their supervisor every few months. The supervisor would prefereably be a Registered Nutritionist or Registered Dietitian with at least three years experience. Explanatory notes on supervision are currently being developed. If you are unable to find a supervisor contact the Registrar. I have an overseas qualification and overseas experience. Can I apply for registration? Provide evidence that your degree is equivalent to a Bachelor of Science in Human Nutrition in New Zealand. You can do this through the New Zealand Qualifications Authority, where you will need to complete an international qualifications assessment. You will need to have a working Visa or be a New Zealand resident. You will need to have one year of relevant work experience in New Zealand either paid or voluntary. You will need to have established networks with nutritionists and dietitians in your area. Continuing competency related to understanding nutrition in NZ. Have a New Zealand based nutrition professional as a referee. Become a member of the Nutrition Society. I have an overseas qualification. Can I apply for Associate registration? Your qualification needs to be a minimum of a BSc in nutrition. You may need to apply for an NZQA assessment of your qualification to provide evidence. After arrival in New Zealand, you will need to have established networks with nutritionists and dietitians in your area, have found a mentor and state your intention for the qualifying year for Associate Registration. This will be work experience or post-graduate study. You can apply for Associate Registration after working with your mentor for a year and studying or gaining work experience. What are the fields of expertise for Registration as a Nutritionist? A Registered Nutritionist will be registered in their field of expertise as determined by the Registration Panel. Generally working in academia or a scientific institute, regularly publishing peer-reviewed research. For example, Scientist at Plant and Food Research, scientist at a university. Generally working in a scientific institute or food-related company, regularly publishing peer-reviewed research. For example, Scientist at Fonterra. For example, medical practice, sports organization, primary health organisation, Maori or Pacific health provider. Working in health promotion, policy, advocacy, resource development, nutrition communication, community education. Working in an educational institute, planning courses, delivering lectures/seminars/classes, assessment of work. For example, university, institute of technology, school. Provide advice to industry clients, technical and nutrition information, marketing. For example, Fonterra, Beef and Lamb, Nestle, Wyeth, infant feeding. Working in a food-service setting providing nutrition expertise for menu-planning, recipe development etc. For example, Hospital food-service, catering company. Nutrition and health journalism and media work, marketing, public relations, food-writing, and other communication of nutrition-related messages. The Nutrition Society of New Zealand is an organisation of qualified, practising health professionals, scientists and educators with a range of backgrounds who are bound by a shared interest in nutrition.